The article does note that pointing lasers at aircraft is illegal. And, if they are from another planet, aiming lasers at aliens is not smart. Below is one of the YouTube videos referenced. Lasers are shown at 0:04-0:39, 6:55-7:03, 7:23-7:33, 7:35-7:52 (the irregular line is probably due to the rolling shutter artifact of some CMOS sensors), 8:03-8:57, and briefly at 9:00. There is a line from 5:50 to 6:25 but it appears to be a wire and not a laser. 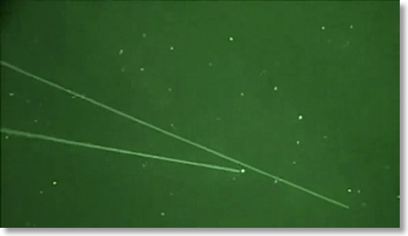 Still frame from 34 seconds into the “Unbelievable Night Vision UFO Events” video. Commentary from LaserPointerSafety.com: Watching the video, one explanation for star-like objects moving at a constant rate is that they are satellites. The brightness increases can be due to satellite flares -- light reflecting off solar panels or other structures. For example, the well-known Iridium satellites have bright “flares” lasting a few seconds -- bright enough to be seen during the daytime. The website heavens-above.com lists predictable visibility times for Iridium and other satellites.